Here in Austin, Texas (zone 8b), gardener giddiness is palpable. Gardens and wild spaces are greening up and blossoming out. It’s March! Spring–visual and meteorological–is imminent, and daily garden evolution attests to that reality. The first blooms in my garden have appeared and are set to lead the botanical charge for a new growing season. 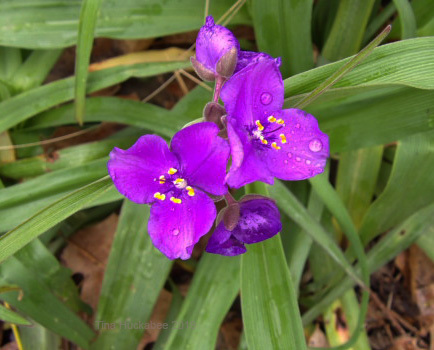 Giant spiderwort, Tradescantia gigantea, is a native wildflower and a reliable early bloomer. Individual plants take their turns blooming, feeding pollinators, and setting seeds throughout the spring months. Summer heat renders Spiderwort dormant. Rainfall is welcome for new spring blooms. 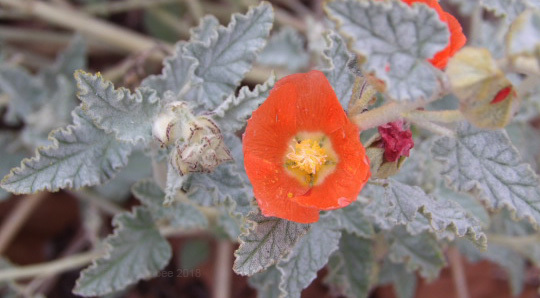 Globe mallow, Spaeralcea ambigua, is not native to Central Texas, but instead, to points west. In full sun and with good drainage, this gorgeous shrub is a cool season bloomer in Central Texas. 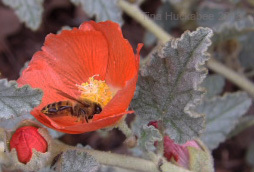 A hungry honeybee joined me in admiration of the blooms; I looked and admired, but she has more “wings” in the game. When she flew off (to one of my backyard hives? ), she was covered in pollen! More blooming goodness is on the way–for honeybees and all other pollinators– awakening from winter and revving their pollinating engines. 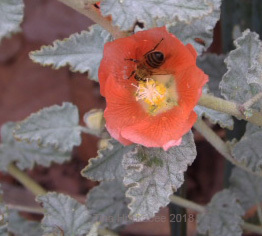 This entry was posted in Giant spiderwort, Spaeralcea ambigua, Tradescantia gigantea, Uncategorized and tagged Texas Native Plants, Texas Wildflowers by Tina. Bookmark the permalink. 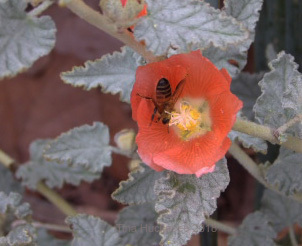 The photos of the bee eating the beautiful flowers of the mallow Globe are wonderful. I love seeing your flowers. Here in Europe we are under a wave of Siberian cold with snow, ice and sub-zero temperatures even on the beaches. In Spain yesterday it snowed on the beaches and throughout the country. Today the snow will rise to 800 meters and below 800 meters heavy rains. We are lucky that in Spain it is remitting. I am now in Madrid, where it rains; but in the country house it snows. Forgive me for this meteorological break, but seeing its beautiful flowers and the good weather it has, I could not resist writing the situation that exists in Europe. Have a very good week. Long live the Spring! Greetings from Margarita. You have had a lot of snow! It seems like it’s late in the season, but that does happen sometimes. I hope you’re safe and warm–you have a good week too, Margarita! Spring is the best in Texas. The azaleas will be in full bloom for next week. Do be sure to post lots of pics of your azaleas–they don’t grow well here. My azalea post is the most popular on my blog. Here they are everywhere, so not so unique. I will be taking photos. I would not have guessed that spiderwort is even from North America! I really did not know. It showed up here a while back. I do not know how it got here. It grows like a weed where it gets water. Spiderwort is weedy here, too. There are quite a few varieties which are native to North America and they grow and bloom beautifully in spring. Spider plant naturalized as an invasive exotic in a few local riparian areas. Spiderwort reminds me of that, but because everyone else likes it, it stays. It does not seem to be invasive after a few years. I sort of like it. I don’t think it’s invasive anywhere around here, though I could be wrong. It can be a problem and that’s when it’s time to yank! Here’s a short article with the kind of details you’ll probably appreciate. I didn’t know about the plant’s ability to detect radiation. Apparently its stamens will turn pink if radiation is around. A good plant for nuclear reactors, maybe! Haha! Info that only a plant geek would enjoy–thanks! 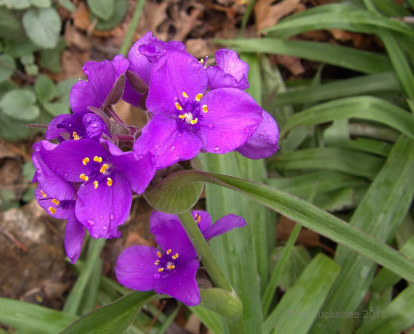 From one botanical nerd to another, check out the link for the giant spiderwort from the LBJWC: https://www.wildflower.org/plants/result.php?id_plant=trgi Specifically, this line: “Acidic soils produce bluer flowers, while more alkaline soils create varying shades of pink and purple. ” I love my purples (thanks, alkaline soil! ), but, oh to have blue ones! That may very well explain the fact that I found a pair of pale blue ones on the same day I found the deep purple. They weren’t far from one another, but in their neighborhood, it’s entirely possible that different soils were present. My Spiderwoarts are usually the first–of many! 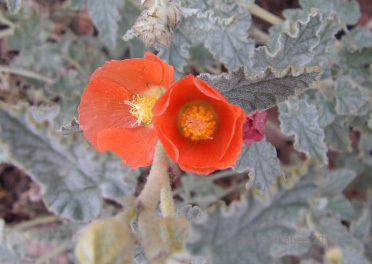 Isn’t the Globe mallow a looker? It’s a tricky shrub to grow, I haven’t had much good luck with it since it needs blasting sun an excellent drainage. Where this one is situated, is just about the best I can offer–keeping my fingers crossed for its continued success. That globe mallow might be just the ticket for my balcony. I can give it plenty of direct sun, and any kind of soil it likes, since it would be in a pot. It’s a beauty, for sure. I don’t think I’ve ever seen it. I saw my first monarch today — or perhaps a queen or viceroy. It was fluttering, and I was going about thirty miles an hour. But it was brilliant, and such fun to see. I saw some damselflies today, too, and of course there are hoverflies galore. I’ve seen a couple of bees, but not many. On the other hand, the swallows are back — just today! If we’re lucky, they’ll start feasting on the mosquitos that are around. That business about a freeze killing mosquitos may need to be fine-tuned a bit. They’re just thick in the refuges, and around some of the ditches. On the other hand, it’s warm, and sunny. I’ll live with the mosquitos. So nice that you’re seeing butterflies! I’ve seen a few, too–those little fast flyers that I can’t catch a good enough glimpse of! Swallows! How wonderful! Mosquitos–not so much! I saw a robin this morning at my pond, but was too slow to catch a photo! I hope he’ll be back sometime this weekend.